Grandma's Knitting Place: Some of my knitting over the last 2 years! 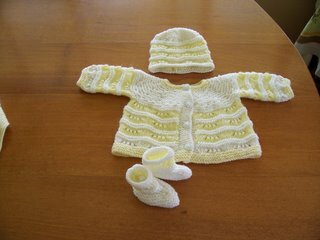 I have made a lot of different styles of baby knits over the last two years or so. 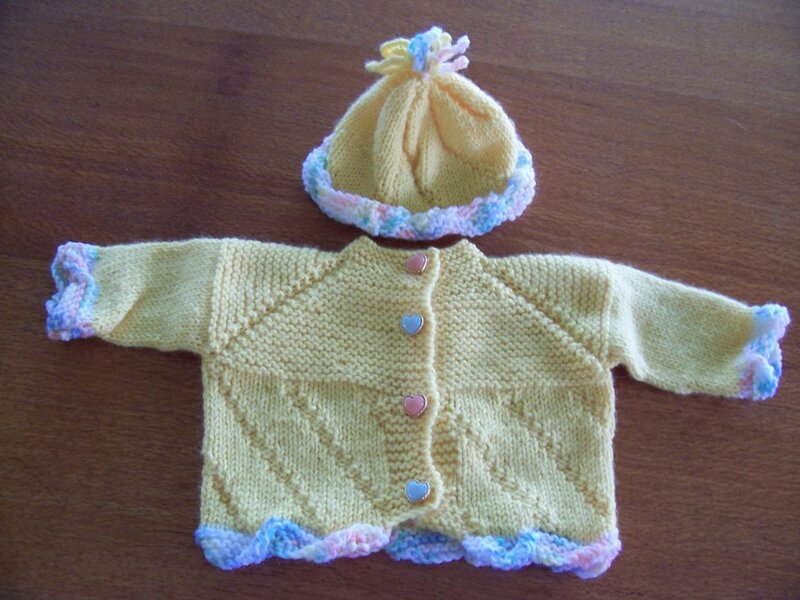 I belong to a couple of knitting groups, Babysweaters, and knitbabysurprise, both on Yahoo Groups. Since joining these groups my knitting has improved in leaps and bounds. I was taught to knit at 4 years old by my father - he was knitting as therapy for a spinal injury received during World War II. So after 50 - odd years of knitting, you can STILL learn something!! There is a bonus pattern for little sockies with it!!!! This little set is my variation on one of the Precious Layettes patterns #3202 by Leisure Arts . I love these patterns - four jackets, bonnets, booties and blankets, all the jackets knitted from the top down with the only seam being the sleeves, and not even then if done on circulars or dpns! 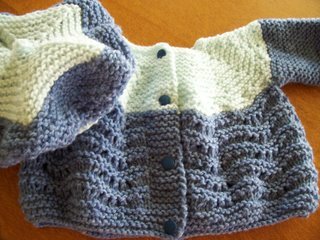 I changed the bonnet to a hat, added a feather and fan stitch to the plain body, and used two colours of yarn and voila! Would you believe this is the same pattern ? Just a different yarn and a different stitch combination!!! The hat is not from the Precious Layettes book - it is from another old Patons book I have ! It is beautiful (as always)!!! I have that booklet and if I may ask, Which pattern is it that you modified? Is it #3? I made the set (not the blanket though) when my son was born.